Please call for pick-up availability! Luxury noise control and soundproofing under carpet, tile, and hardwood floors is now available with just one product. You will experience the ULTIMATE in peace and quiet from noise above and below, without the cost and inconvenience of tearing up your current floor. Serenity Ultimate Underlay has been designed to provide unequaled performance in preventing sound from traveling through floors. 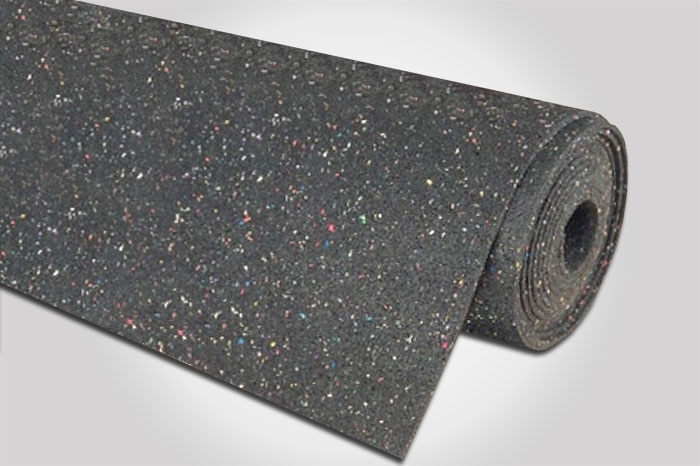 Made in the USA from 93% recycled rubber, our soundproofing carpet underlay will provide valuable LEED points to your project. The weight of the underlay determines how much sound blocking the floor will have. The thicker the underlay, the more sound reduction will occur. When working with installs on wood framing and lightweight concrete the 11.5mm padding is the most ideal treatment. When wood floor is nailed down to the sub floor with hundreds of nails there are 100s of paths for sound to propagate through the flooring. These physical connections are the source of footstep vibration traveling to the room below. Serenity Ultimate Underlay isolates a new layer of plywood from the existing plywood sub floor. This allows the flooring to be nailed to a sub floor, but the nails do not reach the floor framing, preventing the sound from moving from level to level. When working with floated or glued down wood floor Serenity Ultimate Underlay can be rolled out and the flooring can be installed directly on top of the underlayment. When Stone and tile floors require a thinner version of Serenity Ultimate Underlay, so that the stone or tile is not subject to cracking and breaking around the corners. The 6.4mm thickness is recommended and should provide significant sound reduction for stone and tile floors.